Join us at the Holiday Inn Express Mackinaw City to enjoy the comforts of home with the luxuries you deserve. Located just off I-75, exit 339 south to the foot of the world famous Mackinac Bridge. 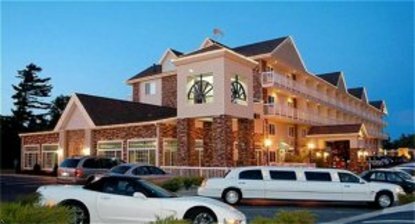 This exceptional hotel is walking distance to downtown Mackinaw City & Mackinaw Crossings offering shopping, dining, historical landmarks & Mackinaw Outfitters store featuring Bass Pro Shops now open year round. In the summer enjoy para-sailing, boating, fishing, golfing, Thunder Falls Family Outdoor Water Park & historic Mackinac Island Free shuttles to Kewadin Shores Casino & Mackinaw Island Ferries. In the morning, treat your taste buds to a delicious complimentary "Express Start" hot breakfast with over 25 items. High-speed wireless Internet allows you to work in the comfort of a plush 4th floor club level suite with a private balcony. Business or pleasure the Holiday Inn Express &regAt the Bridge&reg is the place to be. Don&regt miss the Memorial Bridge Race, Labor Day Mackinac Bridge Walk, Mackinac Island Lilac Festival, St. Ignace Antique Car Show, St. Ignace Richard Crane Memorial Truck Show, Mackinaw Mush Sled Dog Races, I-500 Snowmobile Races, Winterfest, Hops of Fun Beer & Wine Festival. This hotel is committed to providing accessible facilities under the American Disabilities Act. If your accessibility needs are not met, please contact the Hotel Manager on Duty. Should you require additional information regarding accessible facilities for guests with disabilities, please call 1-800-Holiday (U.S. and Canada) or contact the hotel directly. For the hearing impaired, TDD service is available at 1-800-238-5544 within the U.S. and Canada.